A raging, windswept storm tore across the tri-state area as Monday’s peak morning commute got underway, dumping up to 3 inches of rain on parts of New Jersey and trapping people in homes and cars as waterfalls cascaded from the ceiling of the Bryant Park subway station in Manhattan. A flash flood warning remains in effect for all five boroughs and Rockland and Orange counties in New York, as well as Union, Essex, Bergen, Hudson and Passaic counties in New Jersey, until 11:15 a.m. Many spots in New Jersey and upstate New York also face a flood warning. 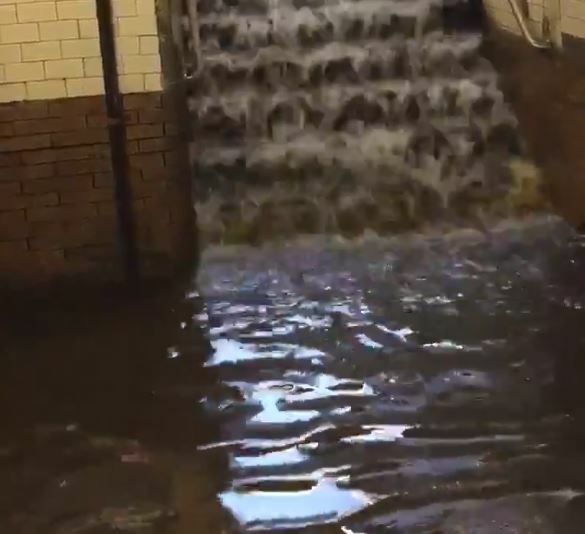 In New York City, water was seen pouring through ceilings at the Bryant Park subway station. A huge amount of water came gushing down the stairs at the No. 1 train station at 145th Street and Broadway. Minor flooding was reported at Grand Central. Some commuters reported waterlogged LIRR trains, while area airports reported minor weather-related delays. Rain should taper off from west to east by late afternoon as the cold front moves through.